I think it’s a fair criticism of Rep. Paul Ryan and Mitt Romney that the tax reform in their budget plans does not specify the loopholes that they plan to close to offset their planned rate reductions. I’ve taken issue with this and have urged Republicans to be more open about what type of favored deductions they’d get rid of, which have become cows as sacred as entitlements. This is something that Jon Huntsman deserves credit for doing in his presidential campaign — he vowed to eliminate every deduction, even popular ones on employer-based health insurance, mortgage interest and charitable giving. Do you see how hard this is? 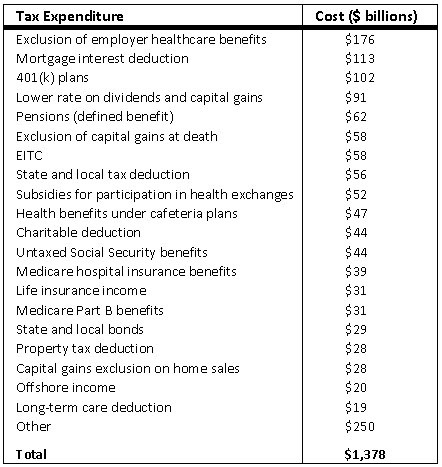 The big ticket items are things like taxing healthcare and pension benefits; the mortgage interest deduction; the Earned Income Tax Credit; the charitable contribution deduction; various state tax deductions; and exclusions for Medicare and Social Security benefits. Needless to say, those are going to be eliminated over a whole bunch of dead bodies. Other big ticket items include tax breaks on dividends, capital gains, inheritances, and offshore income, and all of those would be eliminated only over Paul Ryan’s dead body. There’s not a single thing in this entire table that wouldn’t be a stupendous political lift, and the prospect of eliminating not just one of them, but $400 billion worth of them, is very slim indeed. That’s why it’s important for Ryan to put his money where his mouth is. You can’t plausibly claim that your tax cuts will be revenue neutral if that claim depends on a whole bunch of tax increases that are all but impossible politically. At the very least, you need to set out a marker so that everyone can judge just how palatable your preferred menu of increases is, and whether any of Ryan’s fellow Republicans are willing to face up to the political backlash of supporting it. We already know they love the rate cut part of Ryan’s plan. Now it’s time to see if they’re willing to stand up and be counted on the tax increase part that goes along with it.